A couple of weekends ago I had an intense craving for baba ghanoush, so I decided to make a mezze style dinner. There were only 2 of us so I didn’t go too over the top making lots of dishes, but I did do something I don’t do very often and that is make a dessert. I always use Nigel Slater’s baba ghanoush recipe. It is the best I have ever made or eaten, even though the aubergines were just cooked on my big gas burner and not over charcoal. He’s right though; you really do need to turn the skins absolutely black for the best flavour. I just stick to the basic version because it’s so good, but one day I may try some of his twists. 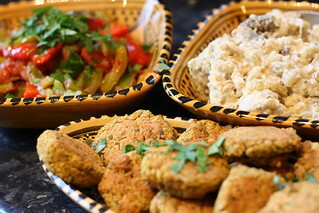 Woman can not live by baba ghanoush alone so I did a few other dishes too. I made the baked falafel from Appetite for Reduction, which I enjoy as long as I forget that they are called falafel and think of them as chickpea cakes. I added in the peperonata from Vegan Fire and Spice, with the extra chili in, some home made flatbreads and a bowl of lightly dressed baby spinach. This was an excellent tasty dinner. It doesn’t look like much but scooping up baba ghanoush and salad with flatbread alongside the sweet oily peppers and crunchy chickpea cakes was a delight. Unusually for me, I made dessert. Matthew had a dessert wine he wanted to open (which turned out to be corked anyway), so I had a hunt for something easy which could be prepared ahead and contained storecupboard ingredients. I found the baklava in World Vegan Feast and decided to give it a go. I made half of it to fit what I had in, and I used a combination of pistachio, walnuts and hazelnuts for the nutty element. I also couldn’t resist adding a smidge of cinnamon, but I promise it was only a tiny one Bryanna! My filo pastry was a leftover half packet from the freezer, and wasn’t in the best condition, but it really didn’t matter, I just threw into the cooking dish and it all worked out.So easy! I adored this dish. I’m a huge fan of and filo and the delicate flavour of rose was a delight. A little goes a long way, so I was nibbling on recrisped squares of this after dinner all through the week. This entry was posted in Appetite for Reduction, Vegan fire and spice, World Vegan Feast by efcliz. Bookmark the permalink. Your photos are gorgeous, Liz! 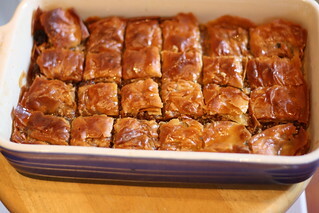 oh my gosh that baklava is perfect! what a feast!